President Donald Trump tweeted his State of the Union brought in 45.6 million viewers. Some of his predecessors drew more than that. 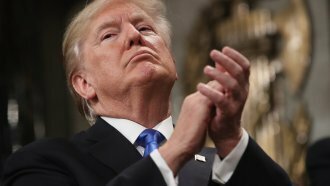 President Donald Trump tweeted that his State of the Union had the highest number of viewers in history. That's not accurate. Trump said 45.6 million people tuned in to his speech. That figure appears to come from Nielsen, a company that tracks TV ratings and viewers. Nielsen keeps a log of past State of the Union addresses, and according to its data, Trump's speech was pretty far from the most watched in history. Former Presidents Barack Obama, George W. Bush and Bill Clinton all drew significantly higher numbers for some of their addresses. Obama's first State of the Union in 2010 attracted around 48 million viewers. Bush's 2003 address pulled in about 62 million. And in 1998, Clinton's speech had roughly 53 million viewers.